Marxists the world over see the current recession/Depression as a golden opportunity to advance socialism. We're about to experience the 1930s all over again. 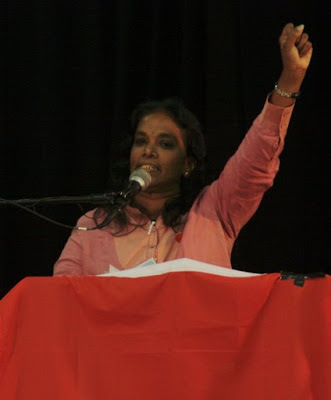 Here's M Saraswathy, deputy chair of Socialist Party of Malaysia, rallying the troops at the Democratic Socialist Perspective's World at a Crossroads conference, held in Sydney, Australia, April 10-12. Cuba si! Yankee no! Uh! Ah! Chavez no se va! Red salute from Malaysia to all friends and comrades! The Socialist Party of Malaysia thanks the Democratic Socialist Persective, Socialist Alliance and Resistance for inviting us to this valuable World at a Crossroads conference. One of the most widely known truths today is that capitalism is in deep crisis of its own making . The endless search for greater and greater profits with complete disregard for people and the planet has inevitably resulted in crises which capitalism itself cannot solve. The clock cannot be turned back on global warming, which has resulted in major changes to temperature and natural phenomena, and which poses a serious threat to future life on Earth. Capitalism has also created a crisis of resources. The resources of the world are being exhausted and depleted by unplanned production and wasteful exploitation. Peak oil production has been reached and we face the prospect of a world that is short of energy resources. Currently we are all in the midst of a worldwide economic recession that is entirely created by the capitalist system. Thanks to global capitalism no country in the world is spared. Workers are losing jobs in millions; there is widespread homelessness and misery. The recession has created and is going to create massive poverty. World poverty figures are going to skyrocket. Of course, the capitalist-run media mourns not the huge suffering of the people but the bankruptcy of financial institutions, the drop in the billions owned by the billionaires, and the billions being pumped in by capitalist governments to save the capitalist system. The constant warning is that this is going to be the worst economic crisis in 80 years, and even worse than the depression of the 1930s. For us socialists this means a long period of suffering and deprivation for the people, brought about by the ruthless profits-first and greed-driven system. But this very bleak period also is a period of great hope, having created the objective conditions necessary for ending capitalism .Widespread unemployment and poverty also means widespread disenchantment and anger. We have the opportunity to create awareness among workers by exposing the capitalist system as a system that rides on the super-exploitation and repression of workers. We have the opportunity now to create awareness about the socialist system. We have the opportunity to empower workers. I think we are all agreed that the objective conditions are ready for a change. But are we ready to use this opportunity to fight for a socialist future? I would like to propose some actions we should take in order to be able to respond to the crisis of capitalism. One of the biggest obstacles in the way to a concerted fight against capitalism is factionalism among the left. Many groups seem to be more concerned about the correctness of their ideology and position rather the onslaught of capitalism and how the left will need a joint response to it. There is a need to unite on our similarities as socialists, oppressed by an inhuman system in which the majority remains oppressed, and commit ourselves to struggle for socialism with the working class. There is a need for continuous dialogue over our differences as we work together. There is an urgent need for us to think of the challenges and kind of socialism in the 21st century and how to arrive at it. And to realise that capitalism is still strong and will come back after the recession only because the socialists wasted their opportunity. Human history and the working class will never forgive us if we continue divide ourselves! We need to look at Venezuela and Latin America. Non-socialists are achieving what socialists have failed to achieve in decades. Socialism is being introduced in ways never imagined before. What lessons can we learn from Latin America which we can apply in the struggle in our own countries? We have to go the ground level and agitate, as Che said. Engage with the working class in struggle, empower them. Gain the democratic space to enhance our struggles. We have to write pamphlets for workers to understand and discuss – to create awareness and urge them into action. We have to harness the anger and frustration of the workers and make people aware that humankind is not doomed to suffer under the capitalism system forever. Socialism doesn't drop from the sky! As Rosa Luxemburg said, the choice facing humankind is socialism or barbarism. There will be great anger and dissatisfaction with the existing economic system. Our role is to turn this frustration into a political struggle for a socialist society. Working class of the world unite ! New Zealand was represented by Daphne Lawless from Socialist Worker. Obama's MSM Fan Club Flayed by "The Onion"
Red Chinese "Carrier-Killer" To Prowl Pacific?